It all started with a conversation I had with the National Library of Greece a couple weeks ago. As they shared with me their plans for constructing a massive new National Library, a beautiful facility they hope to open next year, they started asking my thoughts on how to “future proof” their new facility. As I advised them to operate it more as a laboratory for future libraries, where their mission will be to constantly test out new features, options, and systems, it occurred to me that very few people in the library world have any idea about where this current transition is taking us. Over the past two decades, information has morphed and shifted into a myriad of different forms, going digital for the most part, with physical books and paper-based sources, as a percentage of the whole, all on the decline. With digital comes an exponential increase in the number of ways we can access, manipulate, search, parse, combine, manage, and store each of the growing number of elements in the knowledge universe. As a result, our expectations surrounding libraries and the activities and capabilities we expect from a local neighborhood information center, are also beginning to change. Stepping through this list of possible activities, we should begin with the understanding that very few libraries, if any, will have all of them. My intent in creating this list is to help those working with libraries to think about the multidimensional nature of our unfolding digital world. Certainly these changes will affect far more aspects of life than just libraries, but as a society we expect them to be ahead of the curve, helping us understand what we should be paying attention to. As we add technologies like chatbots, virtual reality, and artificial intelligence to our libraries, activities will begin to coalesce around the strengths of particular communities and their regional differences. And that’s ok. In fact every library will need to operate as a working laboratory, testing new equipment, activities, and approaches to our ever-expanding info-verse to see where users gravitate. Traditional Information Archive – Over the years libraries have expanded their collections. Certainly not all are large enough to manage every items on this list, but most have a majority of them. 1. History of every business in region. 2. Overview of every graduating class in every school. 3. History of local infrastructure including bridges, tunnels, waterlines, sewer lines, fire stations, water towers, police stations, schools, etc. 4. Aging of the community done through sequential photo queues. 5. The sound of the city in the form of audio recordings over the years. 7. Local archive for emergency equipment such as emergency generators when the power does down, or emergency lighting, emergency cots, etc. Most people entering a library are searching for something. Over the coming years search technology will become increasingly complicated, but at the same time we will have far more capabilities to use in our search. 9. Bring up every public video of Jane Doe (average person) between 1980 and 2005 when she was in Manchester, England. 10. What are the top 20 most watched videos of an audience laughing at someone who is in the process of dying from a fatal accident? 11. Show me the top 10 Twitch tournament videos of Korean players playing Destiny version 4.3. 12. What are the 12 common features of low grossing movies produced by Paramount Pictures in 1978? Drone Search – It may seem unlikely today that libraries will have their own fleets of drones to deploy for physical search inquiries, but that will change over the coming decades. 13. Using thermo scans, what houses in my city have the least amount of insulation in the attic? 14. Where is the hole in the fence that is allowing livestock to enter the Eagle Ridge Neighborhood and cause damage? 15. Which areas in my city are least likely to get flooded when the river overflows its banks? 16. Give me a 360-degree views of the three major sculptures erected in my city last year? Demographic Search – The demographics of the world is changing and we need better tools for monitoring it. 17. Show me a heatmap of the world, broken down by 1 square mile regions, showing highest to lowest birthrates. 18. What regions of the world are most like Winnipeg, Canada (pick any city) based on climate, age demographics, political views, education levels, scientific interests, personal health, etc. 19. Who is the most knowledgeable person in the world on acidic soil types? 20. Show me a decade-by-decade breakdown of increasing average incomes in Africa since 1900. Over time search engines will deploy a combination of techniques for finding the answer to complex questions. 21. Interactive map of the world highlighting regions currently at 10 degrees Celsius. 22. What world leaders are currently in NYC? 23. Interactive map of butterfly migrations in Panama? 24. What movie has Harrison Ford wearing a blue sweater while chewing gum? 25. Why is this object (hold up an object) important? 26. How famous am I compared to other people in my community? 27. Timeline Search – How have recipes for bread changed over the past 300 years? 28. Who else in the world has a disease like mine? Spherical displays in the future will have the ability to give an accurate perspective of planet earth. 45. Track pollution flows across the ocean in real-time. 46. Monitor major hurricanes from satellites and track new developments on a minute by minute basis. 47. Book a complex travel itinerary from a spherical perspective. 48. Show how warm water currents have changed over the past two decades. These types of spaces will come complete with all the tools, technologies, and supplies for creative people to get creative. 67. Watch live events such as concerts, sporting events, NASA landings, etc. While we no longer need a studio for doing live webcasts, the age of the studio is far from over. In much the way kids that lived a century ago wanted to learn how to fly, young people today are enamored with flying and driving drones. Both will become far more pervasive in the future. Robots will become far more common in the future. Most people have old forms of information on disks, cartridges, stick drves, and tapes, and many are looking for a place to convert it to a new medium that people today can access. Video and Non-Video Games – Games are quickly becoming the cultural norm for most young people today. New Facilities – Most major libraries will be testing out a host of new options to make their facilities relevant for next generation users. As a kid growing up, libraries were always that magical place full of ideas and possibilities. 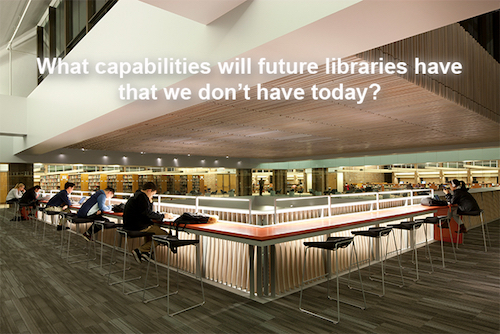 Future libraries will have all that and more. Yes, they will be continually evolving over the coming decades and the key to our understanding them lies in our ability to expand our perspective and reframe our thinking abut their role and purpose. The list above is merely scratching the surface. Libraries can start with a formula, mission statement, policy plan, or lengthy surveys, but in the end libraries will evolve, morph, and transform on their own even without human intervention. It’ll be an exciting thing to watch, and even more exciting to be part of.